The PCW8256 is excellent as a typewriter replacement, but most users find after a time that they want to use their machine as more than just electronic Tippex: which means that you'll need a bit more in your machine to do it with. TOM GRAVES describes some of the options for expanding your 8256 to the 8512 specification ... and beyond. Amstrad's PCW-series machines are designed as packages - plug-in-and-go boxes. As far as Amstrad are concerned, you pays your money, and you chooses either a single-drive 8256 or a twin-drive 8512 with more memory: and that's your lot. You can plug their parallel/serial box into the back to drive a different printer or a modem, but that's the limit of the official expansion. And who. you might ask, would need more than that? Well, actually, a lot of us. Most users find disk space a bit tight, especially on the 8256; those 180,000 characters-worth of space on each side vanish pretty quickly if you back up your files. And copying discs on an 8256 is a real chore, involving you rn endless disk-swapping. So even if you never want to create individual files too big for your 8256 to handle, there are clear advantages in upgrading. A low-cost memory upgrade to boost the size of your machine's 'RAM-disk' (the so-called M: drive) will immediately reduce disk-copying to a simple two-stage process - you simply copy an entire disk into the M drive, put in the new disk and copy the information back. If you go a stage further and add a second diskdrive, you won't need to swap disks at all. For many users an upgrade will make a huge difference. The first key question you should ask yourself is whether to stick to the Amstrad three-inch disc standard or, as I would recommend, to go a different route. You'll end up having to keep stocks of two different types of disk, marking them clearly to remind yourself which type is which. So if you have to have two different types of drives anyway, there's a good argument for suggesting that one of those drives should be the same type that almost everyone else in the computing world uses - the five-inch. (Actually five-and-a-quarter inches, but let's stick to round numbers.) Taking this option can actually save you money because of one major factor: the cost of the disks themselves. Three-inch disks - in case you hadn't noticed - are expensive and relatively scarce. The odd disk or two may seem like petty cash, but if you use a lot of disks the cost can build up in a frightening way; it's easy to spend more on disks than you paid for the computer in the first place! will do all the work for you at your own home or office, and they guarantee the result. You don't have to have it all done at once, either: you can have the second drive fitted separately from the memory upgrade. Having the drive fitted will set you back £159.00 + VAT, and the extra 256K of memory to bring the total up to 5I2K costs £64.50 + VAT: a total of £223.50 + VAT (£257.02 inc* VAT) if you have the full upgrade to 8512 spec. For full details dial 100 and ask for "Freephone Dictaphone". Five-inch disks are available anywhere and are far cheaper: as low as 50p if you know where to look or can buy in reasonable bulk. Most of the expansion units that attach a five-inch drive to the Amstrad cost around £200, or about £50 more than upgrading to a three-inch drive, but you can recover that difference in as few as fifteen disks! And since five-inch disks are what most other computers use, that means that you can swap files (but not necessarily programs) with users of other machines - including the much-awaited Amstrad IBM clone and other IBM look*alikes, the BBC micro and many others - without the dubious joys of messing around with cables and baud rates and the rest that Amstrad suggest when you buy the CPS8256 parallel/serial board. One of the options we review here, the Gemini InterGem, allows you to choose the type of drive you want to connect to your system, including a 3.5" for compatibility with machines like the Apricot and many of the IBM-compatible portables. Most of the others give you a plug-in-and-go five-inch drive, which is certainly an easier way of doing it if you just want to add more disk space at reasonable cost. All of the suppliers of disk units provide programs which make it a simple matter to move files between Amstrad's CP/M and other operating systems like the IBM-clones' MSDOS or the BBC's DFS. Any upgrade, other than the official one will involve you - or a friend or colleague - taking your machine apart and putting it back together again. To some this is a daunting prospect, but you could find it easier than you think. It's a simple enough matter to remove and replace the back of the case and, if necessaryt that surprisingly small computer board (just a handful of accessible screws - Amstrad are a great deal more sensible in this than many other manufacturers). You only need a long-shafted Phillips screwdriver - not less than six inches, or you'll have trouble with the lower screws -to get at the six screws on the back. But you do need to be aware that there may be very high voltages around that fragile television tube — even when the power is off - and that it's possible to wreck the main circuit board with static discharges and the like if you don't know what you're doing. We're pleased to note that all the suppliers described suitable precautions in their instructions: do take heed of them, or else you could just possibly damage your machine - or you - beyond repair. You should also understand that you invalidate yourmachine's guarantee by doing it yourself. Whilst it's true that Amstrad's standard guarantee period is hardly lengthy, this certainly does matter if you've taken out a service contract on the system. If you have, you're probably best advised to stick to the official option. If you want to turn your machine exactly into an 8512 you'll need to invest in a Hitachi-type three-inch drive upgrade. We've looked at kits from two suppliers, Silicon City and Citadel. In both cases, the drive is the same as the 8512's B: drive, giving you around 700K of space per disk -though it will usually work only with a higher-quality CF2DD disk rather than the standard CF2 disks supplied by Amstrad and others for the original A: drive. Fitting the second drive is simple enough: it fits in place of the blank panel below the standard drive. Amstrad's own instructions for the process occupy all of one side of an A4 page, and most of that is pictures. Despite the rather ominous hacksaw in Citadel's advert, the only tools you should need are a screwdriver and a clear head. Everything other than the drive is already there in your machine; the cables are ready wired, and both Locoscript and CP/M software will recognise it automatically once it's fitted. It is just about possible to screw it in wrongly, or to mount the cables upside-down, but you'll have to try pretty hard to get it wrong. Silicon City charge £135.00 inc. VAT for the drive on its own, or £160.95 inc. VAT with the memory upgrade; Citadel only supply the complete upgrade kit, including 256K of memory, for £189.95 inc. VAT. Most other computer systems, such as the BBC or the ubiquitous IBM clones, use five-inch disks, and they're a lot cheaper than Amstrad's three-inchers: that's just two good reasons for fitting a five-inch drive rather than the Hitachi type used as standard on the Amstrad, The catch is, of course, they're bigger: they won't fit in the box. So some arrangement has to be made to extend the cables out to an external box that holds the drive, which can make things a little untidy, and certainly rather more fiddly to fit. The advantages, however, certainly seem to outweigh the little extra effort needed to fit the unit rather than a three-inch one. We've looked at two units, supplied by BOX (Benjamin Oughton Xenologistics , for the curious) and Timatic. 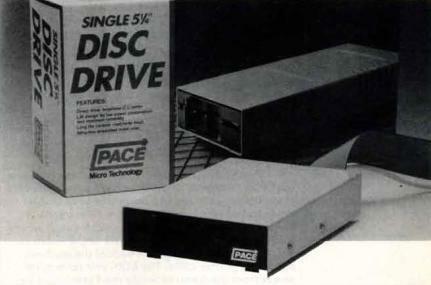 Both use what are known as ‘half-height' drives, with the result that the metal case on both is about six inches wide by two inches high; the Timatic unit (which is also being sold by PACE) is nearly twelve inches deep, though, compared to the nine-inch depth of the BOX unit - presumably to hold the power-supply unit that the BOX drive doesn't need. In both cases, the drive is fitted in much the same way as for a three-inch unit: you need to take the back of the machine off, and fit a connector to the cables inside rather than a complete drive. (The standard blanking plate of the front of the machine stays where it is, of course). Both drives connect to the Amstrad via a cable passed through the back of the machine, beside the printer cable. The BOX unit collects its power from the Amstrad, while the Timatic unit has its own power-supply and plug - a pity, since it detracts from Amstrad's simple 'single-plug' philosophy, but probably necessary for the rather different type of drive. The BOX drive is a standard double-sided 40-track type as used in virtually every IBM clone. BOX's target market would be people using the Amstrad alongside IBMs and the like, for which this unit would be eminently suitable. It means that the disk capacity is limited to 360K in IBM format, or slightly more in its CP/M format. 'Foreign' files have to be copied into CP/M format before they can be used. The software BOX supply to do this is menu-driven. You select type of copy and lists of files by ‘tagging' them on the screen, making it easy to pass files between CP/M and the IBM's MSDOS or PCDOS. The one limitation is that you can only read and write to the MSDOS ‘root directory' - you can't access any subdirectories - which is not that much of a limitation on floppy disks anyway. Timatic's unit is. in principle, a little more versatile, as it has a switch on the back to change between the standard 40-track to the much-higher capacity 80-track format- though you may have to use more expensive disks if you do. The unit we were supplied coufd only handle two formats, a five-inch equivalent of the Amstrad 700K B: drive with the switch set to 80-track, or the standard 360K MSDOS format for file transfer to and from IBM work-atikes. The program supplied to do the job (called TDOS) was a little tedious, involving a certain amount of messing around with the switch at the back of the unit, and seemed somewhat slow in transferring files betwen MSDOS and CP/M by comparison with the BOX unit; it certainly worked well, though. The only disappointment was the restricted range of disk formats: we did feel they could have made better use of the options available on a drive of this type. BOX also provide a 40/80-track switchable drive similar to Timatic's, but they do comment that this type of drive sometimes has difficulty reading standard 360K IBM files and similar disks: if that's your main requirement, you're safer sticking to a 40-track unit. One slight difference between the three-inch and five-inch drive standards is in the way that the circuitry and software recognise the existence of the drive. This means that with a five-inch drive fitted you have to start up the Amstrad in a slightly odd way. Before you turn the machine on, or press Shift-Extra-Exit to reset, you have to make sure that there is a disk in the five-inch drive, and that the drive door is closed - otherwise the Amstrad won't know it's there, and will be quite adamant that you have no B: drive. There doesn't need to be anything on the disk: it just needs to be there. For safety's sake it's best to use a scrap disk for the purpose, as some drives have been known to write garbage to any disk in the drive as the unit is powered up or down. BOX charge £177.50 inc. VAT for their 40-track drive or £207.25 for the 40/80-track drive, with a further £23.50 for the Xeno MSDOS-to-CP/M file transfer utility; more details from them on 0865 717968. The unit from Timatie (0329 221735) costs £209.00 and includes the TDOS file transfer utility in the package. We've put Gemini Marketing's InterGem unit in a category of its own as it approaches the question of expansion in a quite different way: it's an interface unit that allows you to connect your own choice of drive, rather than giving you a 'package deal'. Gemini supply software and a circuit board that you fit in place of the Amstrad second drive, leaving you with a front panel with standard sockets for disk drive power and data. It does look a little messy, with cables trailing out of the front of your Amstrad; and while this does give you a lot more versatility than the 'plug-in-and-go' approach, it's really only practical if you already know a fair amount about computers in general. If you don't... well, it's one way to learn! The easiest way to use it is to plug in a drive supplied as BBC compatible*, available from several suppliers including Gemini themselves. The unit can support a 3", 3.5" (as on the Apricot and the like) or 5" drive under a number of different disk formats, giving different disk capacities to match a variety of machines. The 80-track formats give you a practical capacity of at least 700K - the same as for the Amstrad CF2DD second drive - and in some cases as high as 800K, It's safest to stick to one format, though, or you're likely to end up with the unfunny game of ‘guess the format' when someone forgets to label a disk correctly. The manual lists some 65 formats that their software supports as standard, although some - such as the 'Stan Smith' format! - are dearly for individuals' 'homebrew' machines. More useful ones include DEC Rainbow, Gemini, Kaypro, Octopus, Research Machines, Osborne, a variety of BBC DFS formats and the inevitable IBM. The software itself is supplied on a standard three-inch Amstrad disk, along with (for reasons best known to Gemini Marketing) a copy of a Space Invaders program. The drive can be set up as any of the CP/M formats, which means you can use files from those machines without copying them to Amstrad format first; MSDOS and BBC formats have to be copied first as for the other units we've looked at here. All file copying and setting up of disk formats is done in the good old unfriendly CP/M fashion, with unintelligible program names and command lines rather than simple menus; I would say it's best suited to specialist users who need the versatility, rather than for simple expansion of your system. As someone who needs that versatility in my own work I liked it a lot, although it's certainly not the cheapest upgrade. InterGem is supplied by Gemini Marketing for £99.95 inc. VAT, including alt necessary software; a suitable drive will cost anywhere between £60 and £140 depending on type - Gemini can supply a full package complete with 40-track five-inch drive for £199,95. Whether or not you need a second disk drive, you can makeyour working life a good deal easier at minimal cost by increasing the size of your M-drive RAM-disk to that of the 8512. All 8256's have the sockets on board to add another 256K of RAM, so adding more memory simply means plugging eight devices into their sockets and flipping a switch or (on older machines) changing a link. You can get Dictaphone to do it for you, of course, but if you're willing to do it yourself you can save yourself half the cost or more. The only expansion option is an extra 256K to bring the total up to 5I2K, So all the memory upgrades are much of a muchness: there's not much to choose between them apart from price and the helpfulness of the supplier. Silicon City of Cambridge charge just £25.95 inc. VAT for theirs: their instructions are clear and concise. They also supply their instructions separately for people who already have the right devices. Timatic charge £49; their phone number is Fareham. Citadel Products normally supply their memory upgrade with a three-inch drive as part of a full upgrade package, but the memory part is available separately at £39.95. 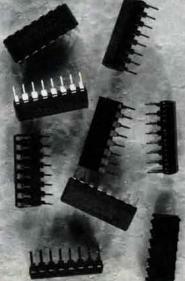 One point which ail the suppliers emphasise is that the devices do not like being fitted the wrong way round... And they need to be handled with some care since their insides are highly sensitive to static electricity: they can expire even with the static created by a nylon shirt or an overly inquisitive cat. Modern devices are much more robust than the old chips used to be, but it's nice to see that Silicon City have had the realism to offer single devices at £5.00 a time in case any should fail.